The original pewter edition of 250 is sold out. We used the opportunity to rethink the functionality of the design as a solid single mold cast in high-polished stronger metals. The design of the H.R. 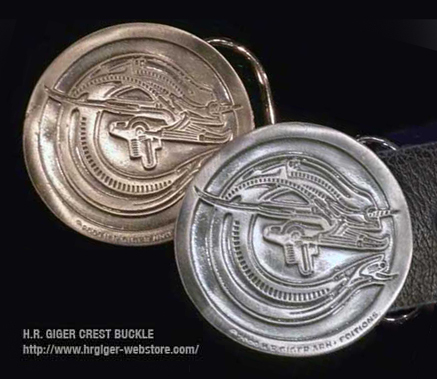 Giger Crest Buckle is based on the painting Alien Monster V, work# 410, 1979. By reversing the direction of the original painting, it has become Giger's own distinctive © logo, representing the one and only true creator of the Alien monster. Unlike almost many of the other products, this item in NOT cast to order and is, almost always, in stock and ready to be shipped within a week. Please specify which metal you prefer, nickel bronze (silver color) or brass (gold color). Emblem for a Secret Society Belt Buckle Stering silver, 3" (7.5 cm) widthThe design of this belt-buc..
H.R.Giger Alien Crest Buckle Nickel bronze (silver color) and brass (gold color) 2.5" inches ..